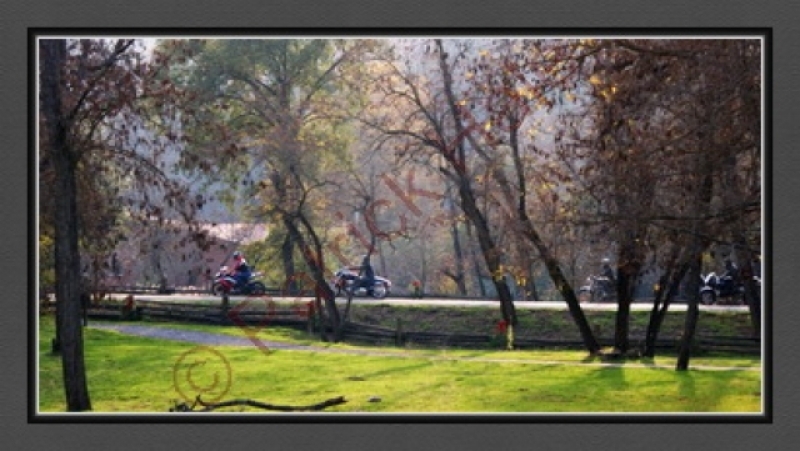 Here’s a picture of motorcyclists enjoying the sunshine and the historic sights at the location that started the California Gold Rush. On January 24, 1848, James W Marshall found gold at Sutter’s Saw Mill near present-day Coloma. Coloma was named for a Southern Maidu Indian Village near the site of the discovery that transformed the Golden State. 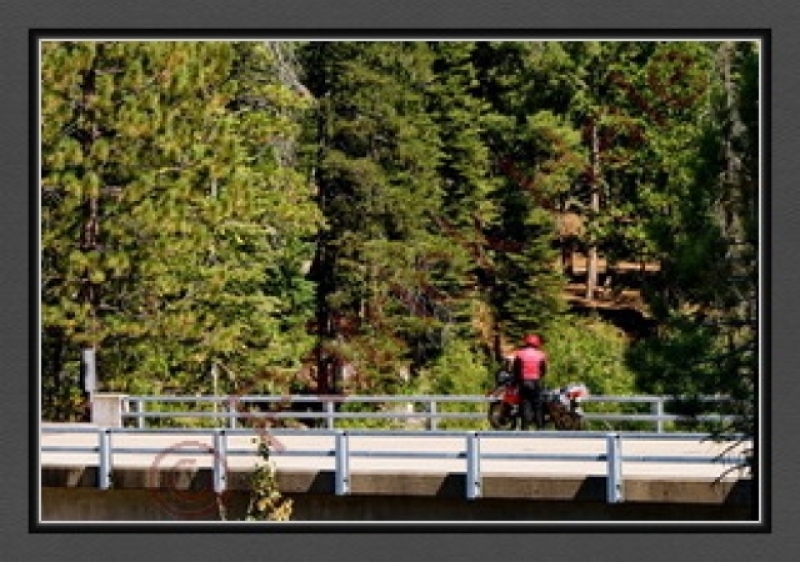 This motorcyclist stopped in the high Sierra to check out the Silver Fork of the American River. The area is quite remote and is home to a number of USFS-designated “primitive” campgrounds. 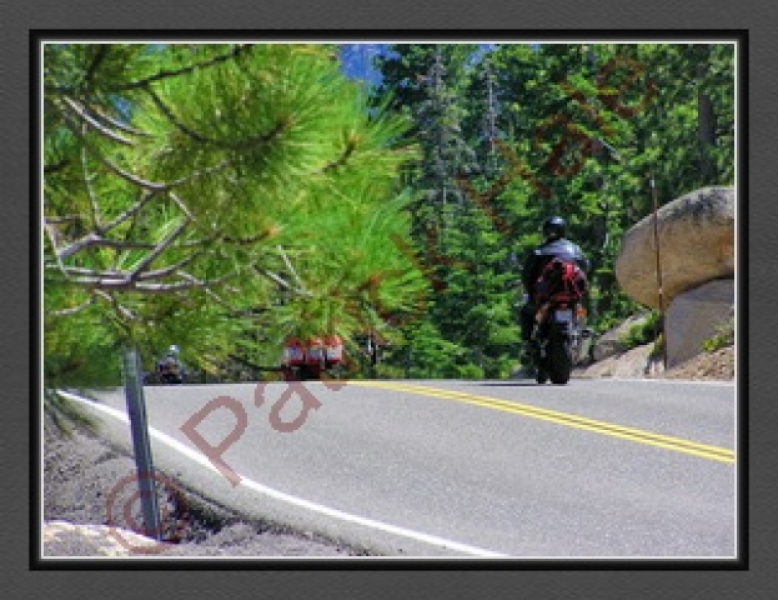 The area also has good motorcycle roads to take in the splendor of nature. Riders getting ready to hit the road in the heart of the Colorado Rockies. 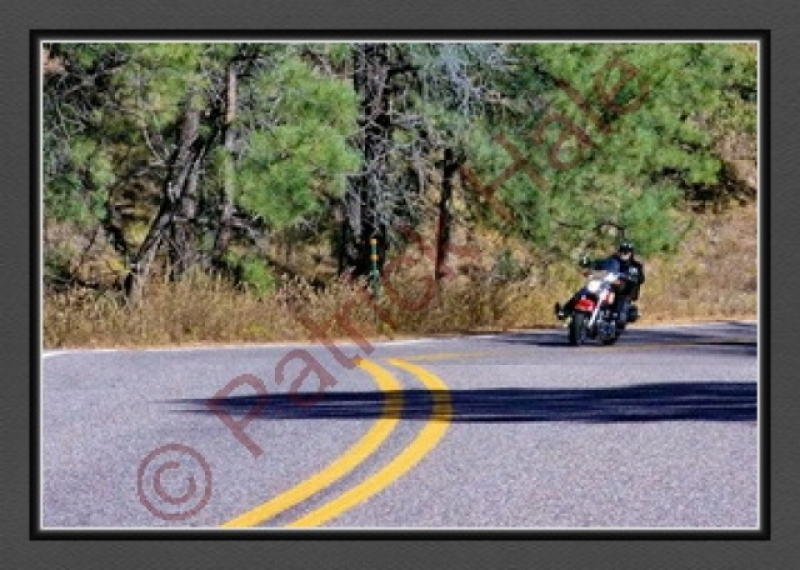 The weather was gorgeous, the scenery was spectacular, the roads were nearly empty, and the riding was great! 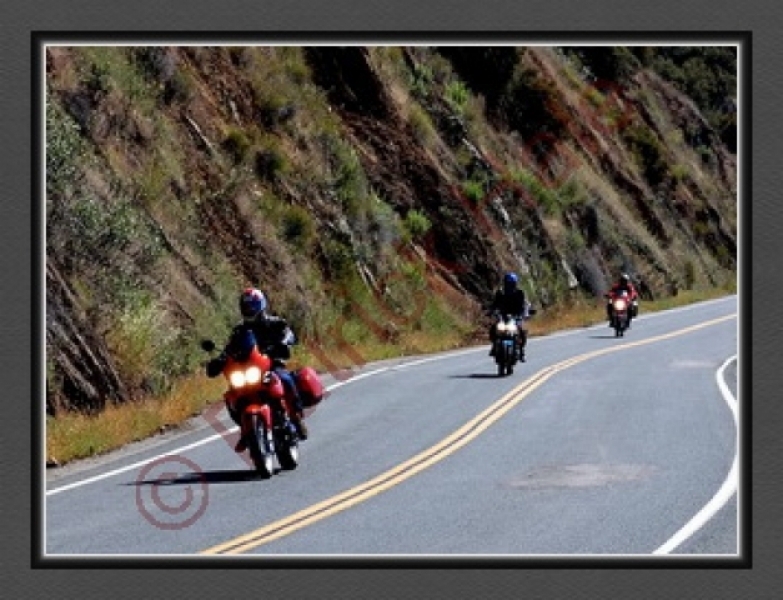 Well-maintained and empty mountain roads put a smile on any motorcyclist’s face. Throw in some corners that can be taken at speed and things don’t get much better. Just keep a sharp eye out for the turkeys, deer, and the occasional cow wandering across the road! Not all the riding is easy and gentle, but it’s usually always beautiful. interesting, and even a little challenging from time to time. What ore could a rider want? Some of the most productive farm land in the world is found in the Central Valley of California. In summer, the native grasslands turn golden brown as they await the rain of fall. Perhaps no other motorcycling road in the US has the mystique and lore about it as the Tale of the Dragon that stretches across the North Carolina-Tennessee border. 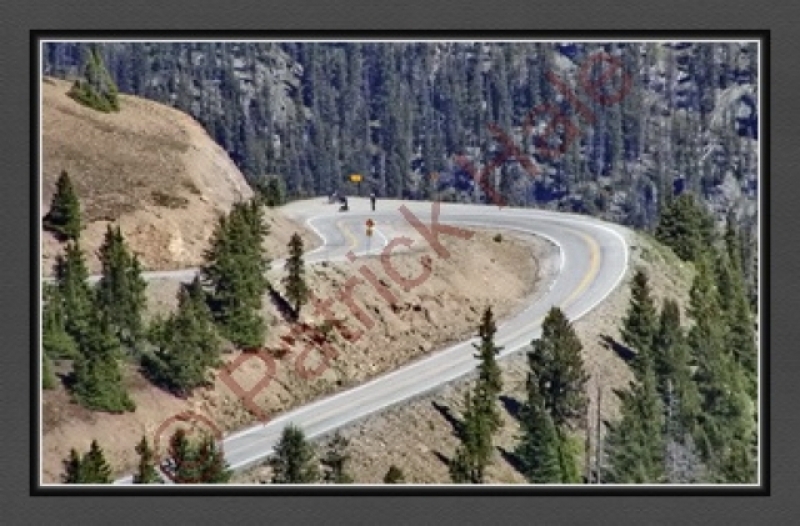 The Tale packs 318 curves into 11 miles of spectacular riding. If you chose to ride it, please don’t try to set a new speed record. 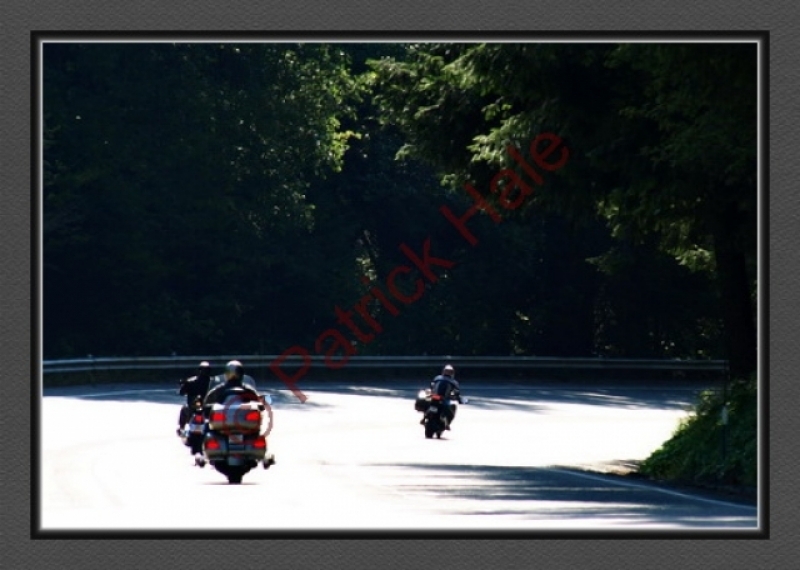 Each year a significant of motorcyclists are injured or killed by trying to ride over their skill level. The whole point of riding the Dragon is to live to tell the tale. 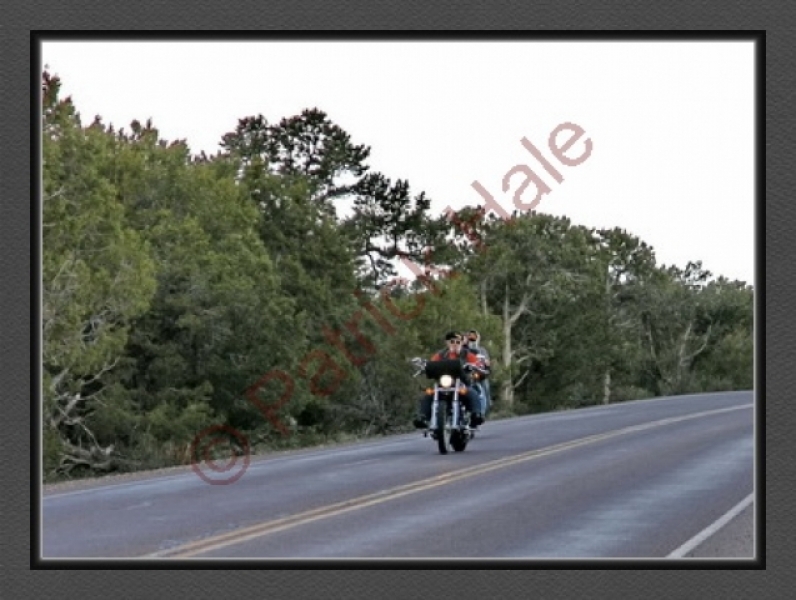 Here’s a photo of a motorcycle taken at the end of a dirt road. The bike was not intended nor designed to travel down the fire road, but the rider finished the journey none the worse for wear. 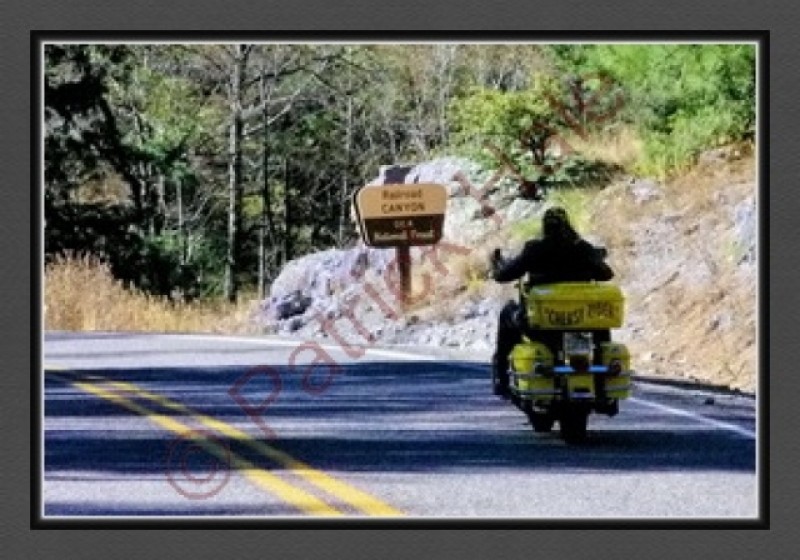 He stopped and enjoyed the scenery once he was back on roads for which his motorcycle was intended. Only the smile on his face gave away the fact that he had just had a very memorable time! 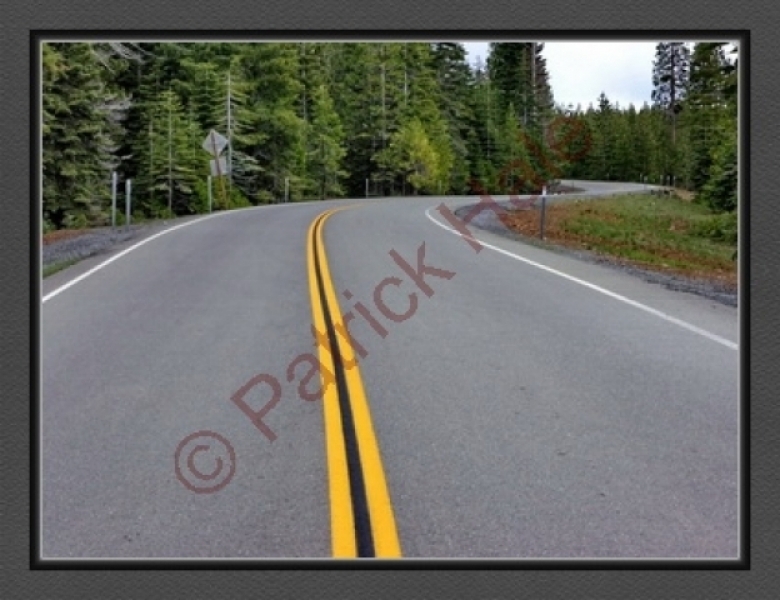 Here’s a picture of the road that the rider had just completed before he emerged back onto paved roads. Both he and his bike were delighted to be on a much more predictable surface. 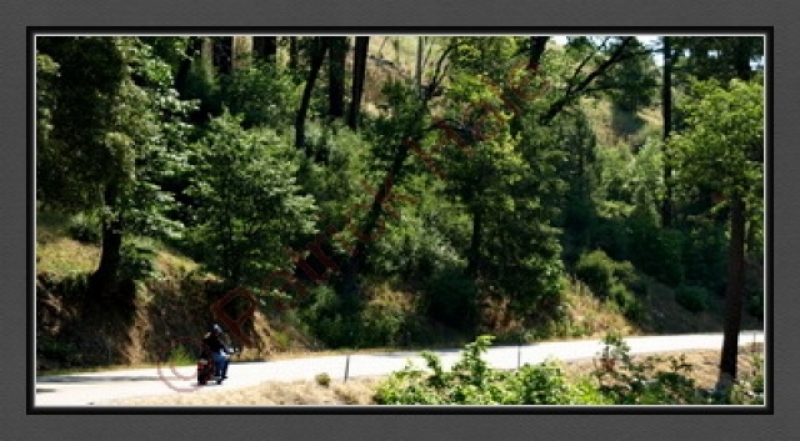 After a moment or two of conversation, he got back onto his bike and waved as he headed higher into the mountains. 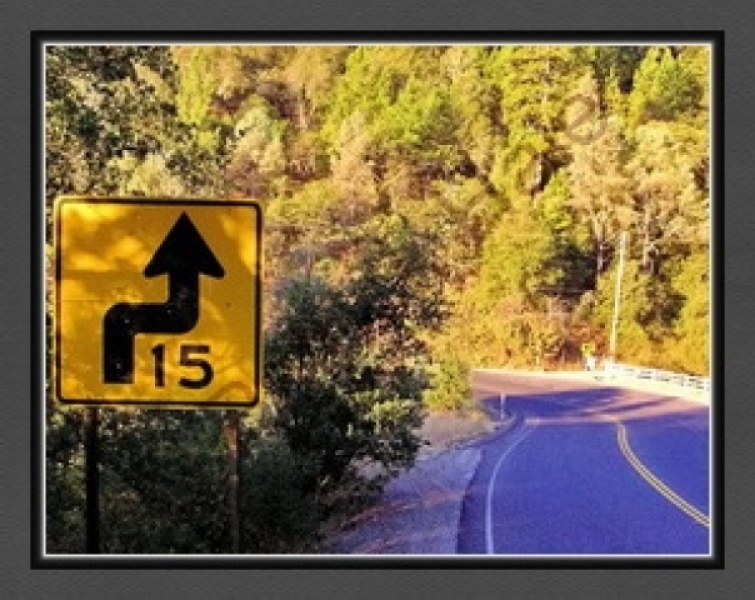 Here’s a photo that shows the beginning of a series of twists and turns that are posted speed of 15 MPH. 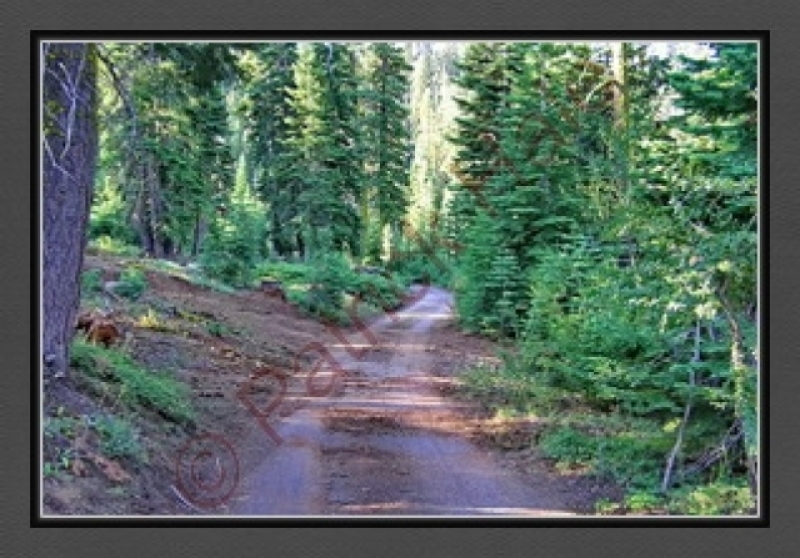 This road is also often used by deer as they head down to the Cosumnes River, located just to the east of this road. This is on California Highway 49, which was named in honor of the 49ers, the prospectors who arrived in 1849, not the NFL team. 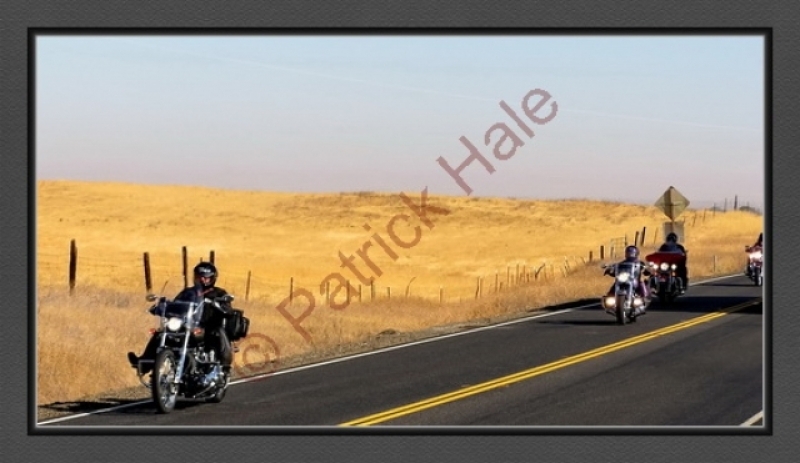 Highway 49 runs north-south through the California Gold Country of the Sierra Nevada foothills. 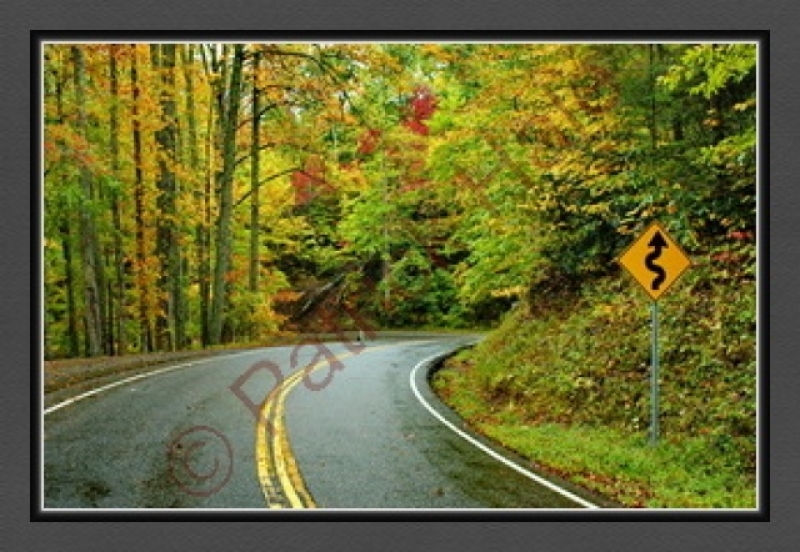 As an aside, the curve sign indicates a turn to the right, but the road actually turns, quite sharply, to the left. Don’t bet your live on the warning signs you see on your travels. Remember, look through the curve and slow down if you can’t see the curve. An ounce of prevention not only keeps you safe, but gives you more seat time on your motorcycle. It doesn’t get much better than that! All you really need for a good time are a good friend and a good road. These two seem to have found just what they wanted. One of the joys of riding is the chance to be a part of the environment through which you ride. On clear, sunny days, there’s nothing better. Even on cloudy, rainy days, there’s a feeling of freedom that you just don’t get driving a car or truck. These riders start of their adventure as they head over a bridge to find out what’s on the other side. 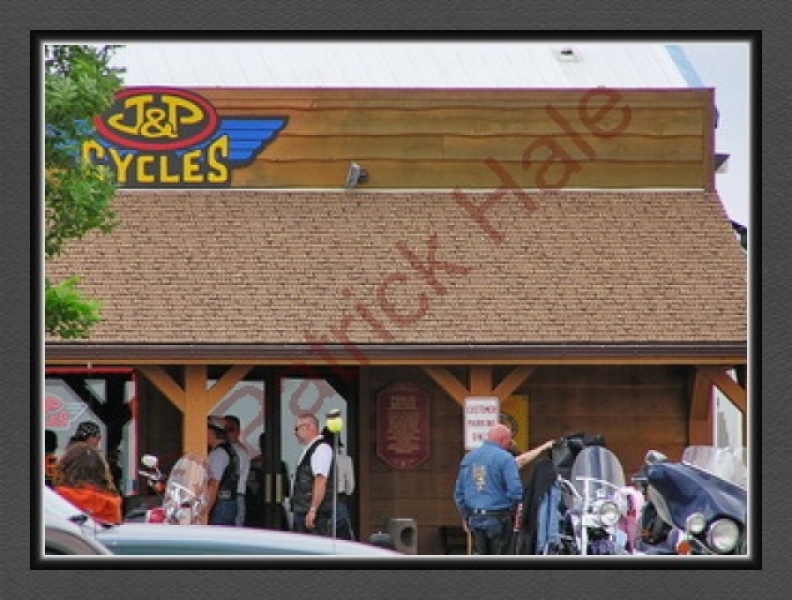 J&P Cycles is one of the landmark motorcycle supply houses in the country. If you want something for your bike, chances are they have it or they can get it. J&P Cycles puts its money where its mouth is and sponsors motorcycle events around the country. They hold a number of planned events all year long to help grow the sport. 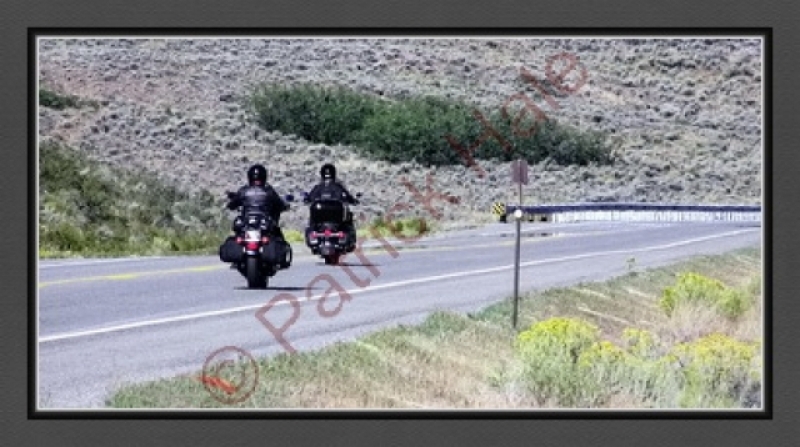 Two riders heading east and enjoying the open vistas and empty roads in western Colorado. Heading east on the south side of the Grand Canyon in the early morning. Crisp mountain air and an empty road. Does it get any better than this? After spending a few days in the mountains, these riders are heading home with big smiles on their faces. They were strangers when they got together, but now they’re friends. Few places are as unique as Lake Tahoe. The average surface level of the lake is 6,225 feet above sea level, making it just under 1,000 feet higher than Denver. The lake is 1,645 feet deep, making it the third deepest lake in North America (Great Slave Lake in the Northwest Territories of Canada is 2,010 feet deep and Crater Lake is 1,930 feet deep). Unlike most bodies of water in North America, the water in Lake Tahoe forms the Truckee River, the lake’s only outlet. The Truckee River flows east, empties into Pyramid Lake in Nevada, and does not go to the sea. The clarity of Lake Tahoe water is legendary and some believe it is because roughly 40% of the precipitation that falls in the Lake Tahoe Basin lands in the lake itself and doesn’t have to flow down from the mountains, carrying sediment with it and literally muddying the water. 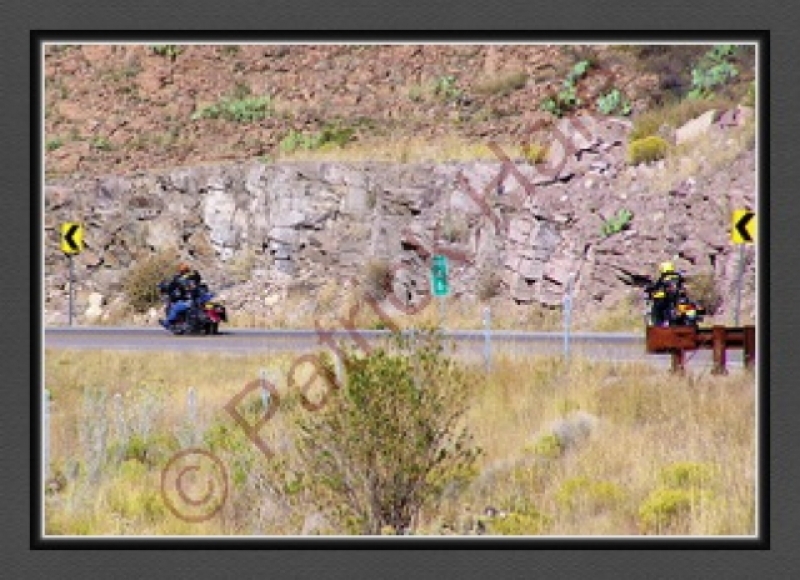 Riding in New Mexico runs the gamut from desert to high mountains. While many people think New Mexico is nothing more than a pancake-like desert, the terrain is actually surprisingly divrse and quite high in altitude. At an elevation of 7,260 feet, Santa Fe, the state capital, is the highest state capital in the United States. It was founded in 1607, making it the oldest state capital as well. The mean elevation in New Mexico is 5,700 feet. The Rocky Mountains stretch from northern New Mexico into Canada to form the so-called backbone of the continental United States. With over 330 days of sunshine per year, the riding opportunities in New Mexico are limited only by your imagination. Few motorcyclists have their sense of humor on display as much as the self-described “Cheesy Rider.” Given the color of his bike, his moniker is easy to understand. His cleverness is exceeded only by his riding enjoyment. 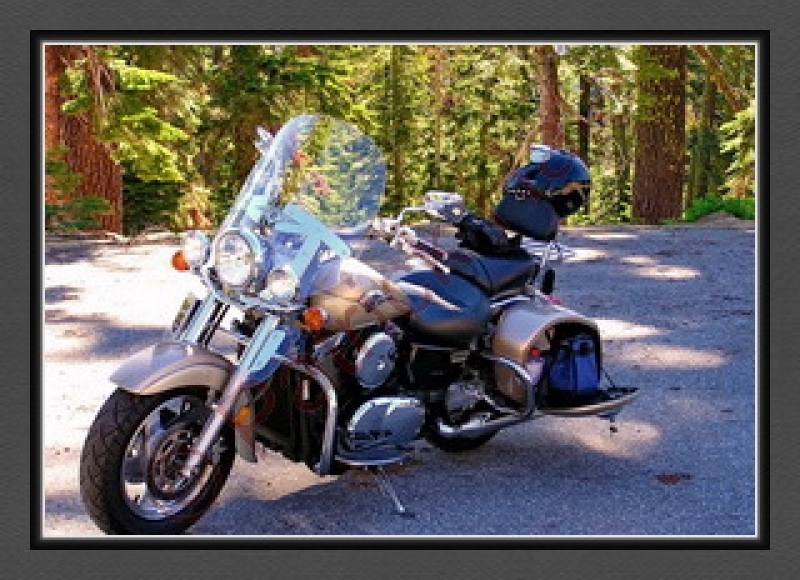 There are as many different styles and types of motorcycles as there are styles and types of riders. Regardless of the bike, the result is still the same. This photo captures the ingredients necessary for an enjoyable ride at a leisurely pace. The road is well-maintained, the traffic is non-existent, and there are lots of twists and turns to make the ride as fun as possible.